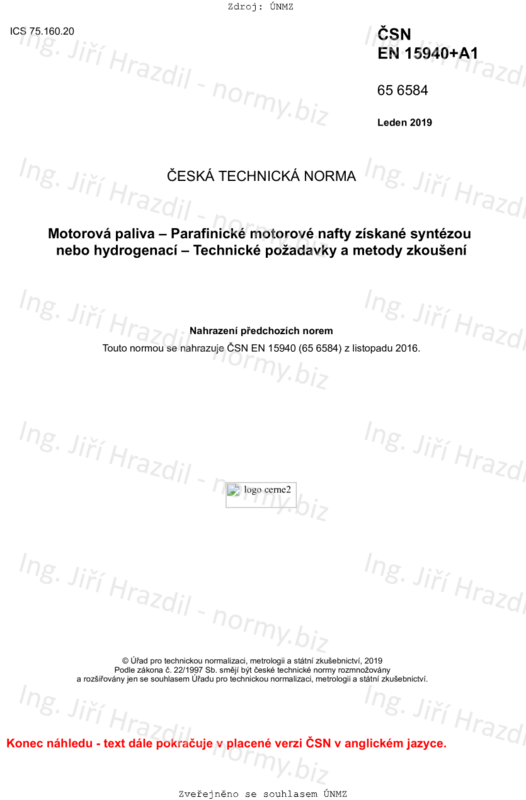 This European Standard describes requirements and test methods for paraffinic diesel fuel marketed and delivered as such, and containing a level of up to 7,0 % (V/V) fatty acid methyl ester (FAME). It is applicable to fuel for use in diesel engines and vehicles compatible with paraffinic diesel fuel. It defines two classes of paraffinic diesel fuel: high cetane and normal cetane. Paraffinic diesel fuel originates from synthesis or hydrotreatment processes. NOTE 1: For general diesel engine warranty, paraffinic automotive diesel fuel may need a validation step to confirm the compatibility of the fuel with the vehicle, which for some existing engines may still need to be done (see also the Introduction to this document). The vehicle manufacturer needs to be consulted before use. NOTE 2: For the purposes of this document, the terms "% (m/m)" and "% (V/V)" are used to represent respectively the mass fraction and the volume fraction. NOTE 3: In this European Standard, A-deviations apply (see Annex D).